Neck reining is a handy skill to know whether you ride English or Western. It leaves one hand free to open gates, handle a lariat, or carry an object. This method of reining was developed by those who needed one hand free of the reins to rope cattle, open gates, clear through brush, among other things. Today, most western riders neck rein. This is handy when you have to open gates, want to maneuver your horse closer to a berry bush or apple tree and have one free hand to pick the fruit, or carry or tow something along with you like a tree for Christmas. Don't worry that your horse will get confused between being neck reined or direct reined. A well trained horse will respond to both methods. Western reins are often a bit longer than English and may be open ended. Hold the bight, or free end of the reins in the hand not doing the steering if you like. This hand can be held in front of you, or dropped down by your side, as long as you do not lean in that direction. Try to keep your shoulders square and help your horse balance. Hold both reins in one hand. Traditionally Western riders hold the reins in their non-dominant hand, leaving their dominant (most often right) hand free to do work like handle a rope or open a gate. Your hand will be centered a few inches in front of your body. Your hand will be 'thumb up', and the free end of your reins will be coming from the bottom of your hand. To turn left, lift your hand slightly and move it left to lay the right rein on the right side of the horse's neck. No pressure should be applied to the bit. At the same time as you lay the rein on the horse’s neck apply pressure with the left leg to cue the horse to bend around your leg. As soon as the turn is complete release the pressure and bring your hand back to center. To turn right, lay the left rein against the horse's or pony's neck and cue with the right leg to help your horse bend. Keep your shoulders square even though you are holding one hand higher to grasp the reins. Don't slump to the side, as that makes it harder for your horse to carry you. 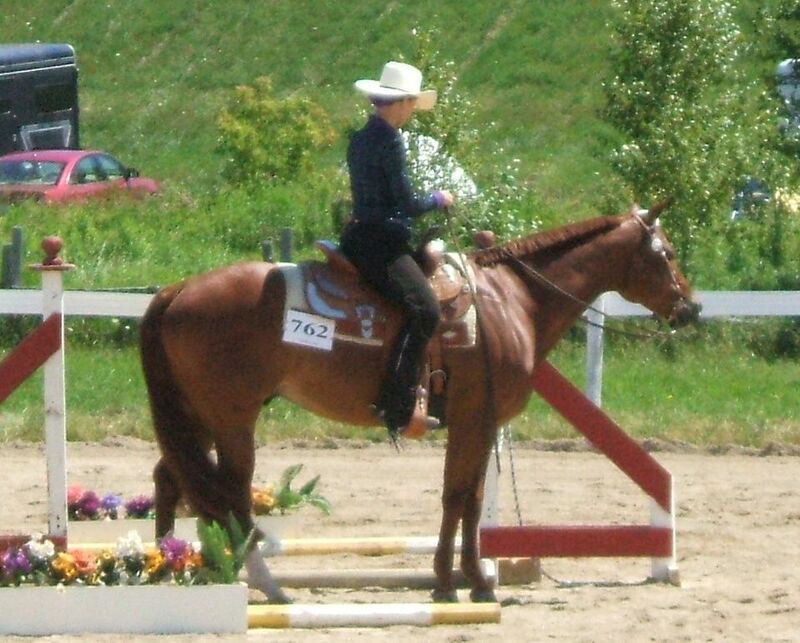 Your position should be the same as when you are direct reining with a hand on each rein. Switching rein hands on long rides may help even out the load on your horse’s back. You may be imperceptibly weighting one side of your seat by neck reining with one hand and switching every so often may help relieve any constant pressure you may be putting on one side of the horse's back. As you practice, your rein aids will become more refined and almost imperceptible. Don't lift your hand too high as this will encourage the horse to raise his head. And, don't jerk, as this can make your horse toss its head, or encourage it to bend its neck towards the inside of the turn. Don't pull back while turning. Your horse may think you're cuing to stop, or become confused. Start with a flat, obstacle free area. Add obstacles as your skills increase. Pylons, buckets, barrels, or bales of straw all make good obstacles to ride around. Practice riding around in circles, serpentine and other schooling figures so you can learn the amount of pressure you need to put on the horse's neck with the reins.